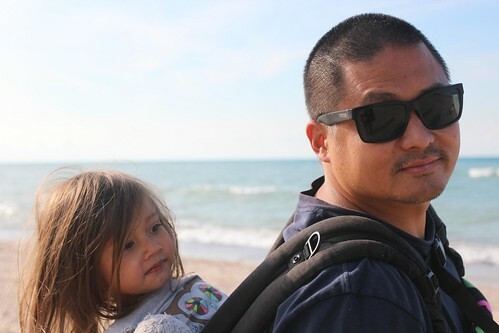 Mali Mish - Day 56: Finding a campground at Indiana Dunes. Mila was running a pretty high fever last night and also still dealing with her stomachache. This morning, she seems to be feeling a lot better. 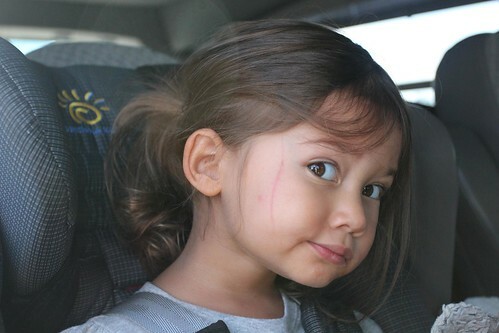 But somehow she managed to scratch her face up right along the side. That’s ok, it builds character. The parts I picked up from 3GStore.com yesterday is already coming in handy. 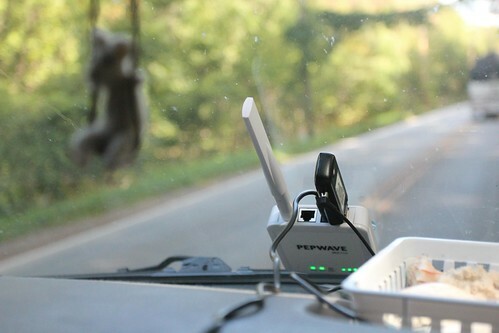 I got a 12-volt car adapter for the Pepwave router and also a magnetic mount antenna for the 3G/4G USB stick. 3G reception along the shore is kind of spotty and the antenna is just what we needed to keep our signal strength high and reliable. Aside from the sand dunes along the Indiana shoreline, there are also a handful of steel mills. 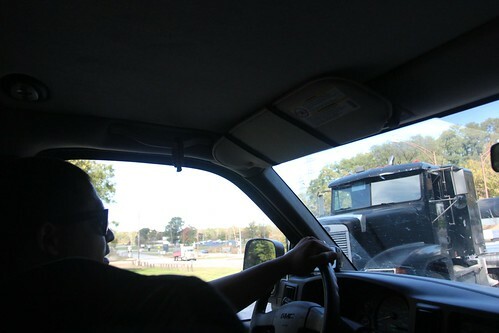 The narrow two lane road is full of big rigs because of it. We came across the entrance to one of them as dozens of steel laden trucks were headed out. 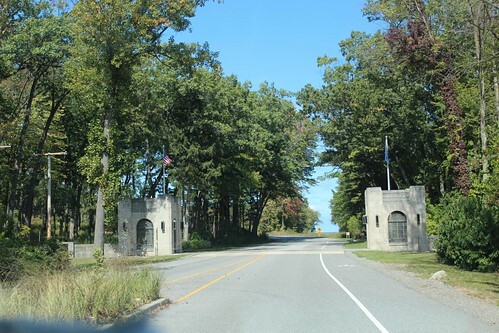 We got to Indiana Dunes State Park and headed in to inquire about their campground. The state park campgrounds have a fair amount of electric and water sites but because of the weekend, we were only able to get one night here. Like many other state parks, out-of-state visitors pay more than residents. Just to get in the park we would have to fork out $10 a day. 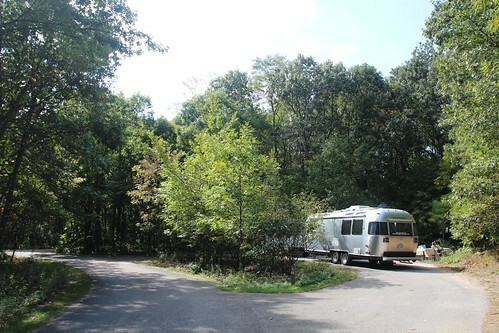 Since we are going to have to find another place to stay for tomorrow anyways, we decided to move on and check out the National Lakeshore campground. By comparison, the National Lakeshore campground is deserted. There were maybe 2 other campers here in about 100 sites. The downside is that there are no hookups. We are planning to stay 3-4 nights here and not having hookups would present a real problem. The heavily wooded campground also means that we wouldn’t get a lot of solar charge. After driving through much of the campground, we decided on a spot that will give us at least 3-4 hours a day of direct sunlight. It won’t be enough to charge us up for the furnace to run each night but we decided that this might be the time to finally get the Honda generator out. So far we have boondocked nearly 20 of those 55 nights without the generator. 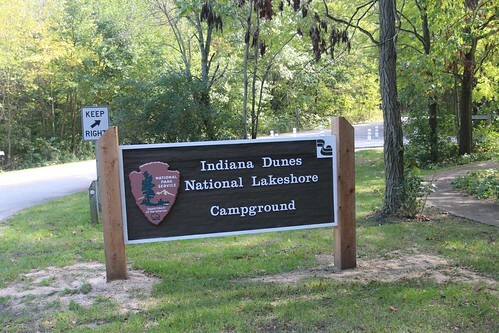 The best part of staying here at the Indiana Dunes National Lakeshore campground is that we get 50% off with our national park pass. That brings it down to only $7.50 a night to stay here. With our new 3G antenna, we also get decent internet connection here. That seals the deal, you can’t beat that with a stick. The weather has also warmed back up to well into the 60s. 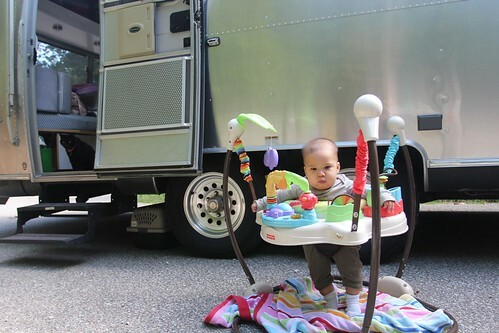 Luka got another chance in the jumper so Marlene’s arms can get a break and Yoda also got brave enough to sneak out of the trailer for some exploring. 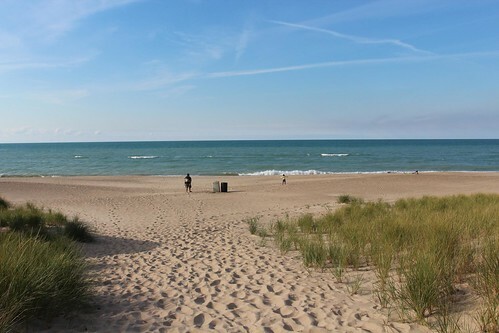 Indiana Dunes National Lakeshore campground is right across the road from the town of Beverly Shores. 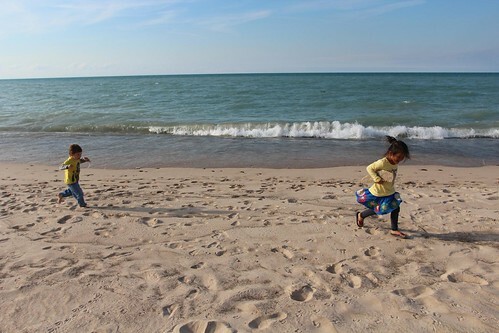 A couple of miles down the road takes you to beach access of Lake Michigan. Just a few weeks ago before Labor day weekend, this place was packed. Today, there was only one other person here with her son. 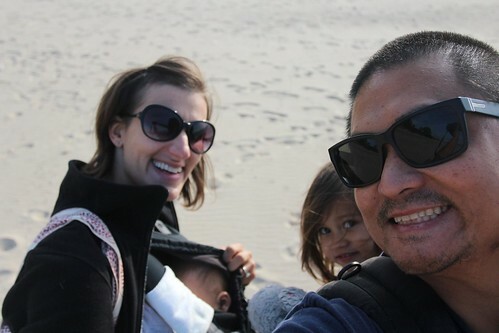 Mila was still feeling kind of weak and under the weather so we put her in her old Ergobaby carrier she used during our last cross country trip. Except this time she rode on my back. Here is our self-portrait of double Ergos. Ava is out running around somewhere. In fact, the little boy who was at the beach with his mom decided that he had to talk to Ava. His name is Oliver and his mom is Andrea. They live here in Beverly Shores and gave us some really good tips about places to see. This boy is not shy at all about approaching girls and is probably going to be a real lady killer when he grows up. Or he might get used to slaps to his face at an early age. We headed into the neighboring town of Chesterton in search of cheap diesel and good food. We manage to score both. Our original plan was to check out a pizza place called Godfather’s Pizza we found on Google Local. Turns out Godfather’s is a pizza place inside a gas station. Umm, no thanks. 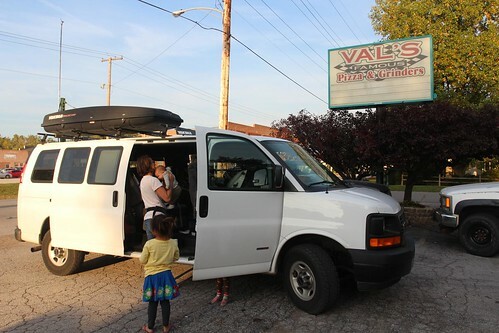 Luckily for us, Val’s Pizza and Grinders is right next door. Val’s has great pizzas, calzones and $6 pitchers of beer. We will have to come back again before we leave here. 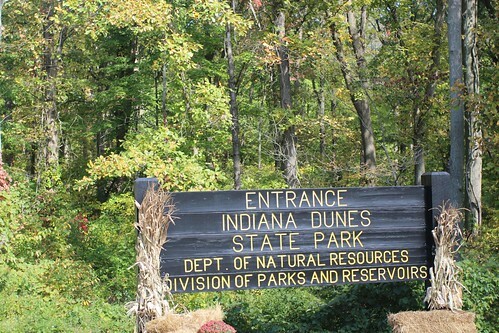 3 Responses to Day 56: Finding a campground at Indiana Dunes. 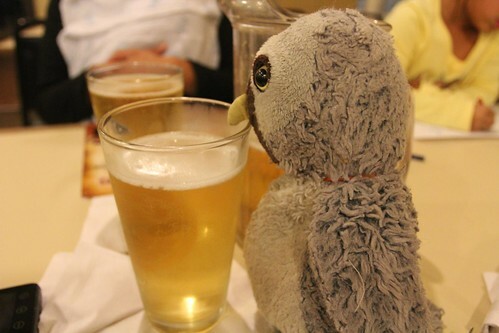 So how many pitchers of beer did you get? I hope Mila is better soon. She is feeling better. Pretty much her normal self now and is back to getting into trouble with us and causing mayhem in and out of the Airstream. She did however become quite fond of the children’s pepto bismo tablets and is asking for it like its candy.